Classic luxury grey lounge with library, armchairs and coffee-table. Collection Mirabeau: A new modular wall unit has been added to the already vast range of furniture to offer yet other possibilities of creativity. The modular wall can be tailored to different needs and finishes. A traditional bookcase may be preferred to other styles of book case for its familiar form, its use of established construction techniques (e.g., wood joinery) and/or its suitability in a variety of settings. It may be tall or low, designed for a wall or corner and may have glazed doors to protect important materials from dust and damage. On ArchiExpo, these pieces are categorized by such properties as material or form. This furniture may add a familiar touch to environments as varied as hotel lounges, office libraries and domestic living areas. 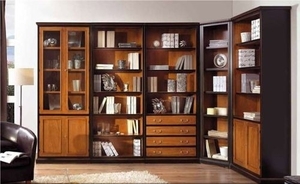 Consider how the style and materials of the bookcase will complement existing pieces of furniture. Dimensions and configuration should suit the space. A large unit can be used to create a library area or even to divide a room, while a smaller bookcase may constitute a more subtle complement to other room furnishings. Other factors include routine maintenance requirements and the possible need to reapply protective coatings.